The Crabwood Glyph info: David Flynn missed!!! From David Flynn's web site. What he missed!!! Wish he was here!!! "Beware the bearers of FALSE gifts and their BROKEN PROMISES. Much PAIN but still time. (Damaged word). There is GOOD out there. We OPpose DECEPTION. Conduit CLOSING (BELL SOUND). Lets look at the 4 answers from the equations David worked out. The apostle Paul expounded on the 'UNKNOWN GOD'S" altar to the Athenians on Mars Hill (Acts 17:18-19)Next Paul went on to Corinth where there was an Antares aligned temple (Acts 18). Antares is 26 degrees south declination Antares is in Scorpio, south of the celestial equator. The star is alpha in Scorpius Constellation and has the name Antares. Is the numbers scrambled for the location of Antares in the Heavens Right Ascension 1630. ‘“For I myself, Jehovah, shall speak what word I shall speak, and it will be Done. From the first Bible I ever read. Thanks Done. Great video! i appreciate your efforts. Now if i could only collate all of the information ... Is that phi in his hand? PI is represented in the Aliens hand I think. Although the numbers are scrambled 103.6 for Antares which lies at Right Ascension 1630 and -26 Declination is there. I did find it odd that Antares is so represented here. I always find the coincidences. 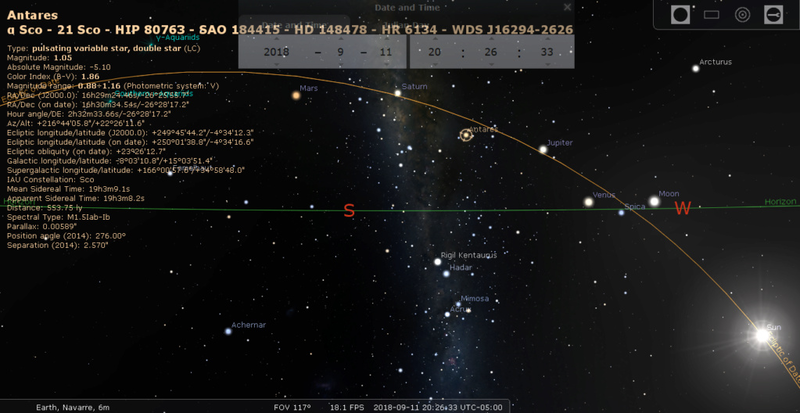 Looking at Right Ascension, R.A and Declination, dec explained. see example at last paragraph. Celestial Coordinates are very important for learning and enjoying astronomy. Every position of an object in the sky is located using this coordinate system. It's as important to an astronomer as latitude and longitude is to a navigator on a ship. Chaisson's explanation is very concise and needs supplementing. 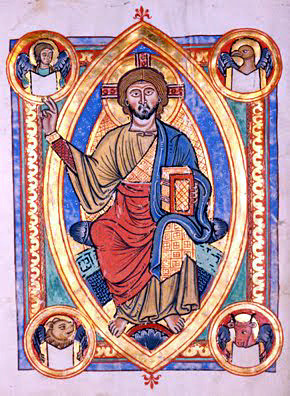 Study Figures 1.7, 1.10 and 1.13 with their corresponding text. Figure 1.7 - This shows the concept of the celestial sphere and the basis of the celestial coordinate system referenced to the Earth's rotational axis and equator. Study this figure carefully while you read 'The Celestial Sphere' on page 9. Earth rotation from West to East -->Motion of the Celestial Sphere from East to West. Figure 1.10 - This adds the motion of the Sun on the Celestial Sphere due to the motion of the Earth in its orbit. As The Earth moves in its orbit in a counter-clockwise direction as seen from the north, the Sun appears to move across the celestial sphere from west to east. This path in the sky is called the ecliptic. It is a great circle on the celestial sphere and crosses the celestial equator at two points. Ascending Node (where the Sun moves from south to north): This intersection defines the reference mark to define celestial coordinates measured parallel to the celestial equator. 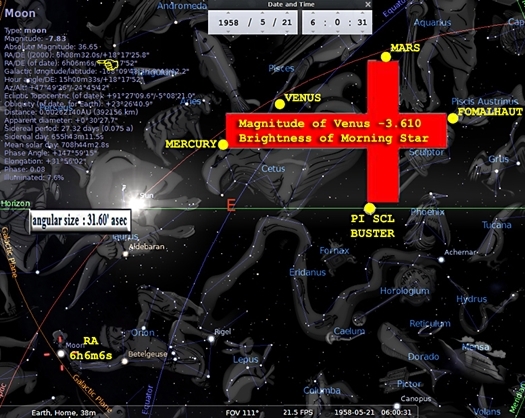 The sun is here(Pisces)at the Vernal Equinox (~March 21). Decending Node (where the Sun moves from north to south): 180 degrees from the ascending node and the sun is here (Virgo) on the Autumnal Equinox (~September 21). Right Ascension, R.A. measured along the celestial equator from the Vernal Equinox in a eastward direction. (analagous to longitude on the Earth) If measured in degrees of angle, right ascension would go from 0 to 360 degrees of angle. However, astronomers uses units of hours, minutes and seconds and since the Celestial Sphere makes one rotation in 24 hours, 24 h R.A. = 360 degrees. 1 hr R.A. = 15 degrees arc = 60 minute R.A. Simple Charts in Chaisson: There are 4 star charts at the end of Chaisson showing the sky from -60 to +60 declination. Each chart covers 6 hours of R.A. The lines on these charts make the celestial coordinate grid. These will be useful for quickly finding constellation and bright stars. Unfortunately, the celestial polar regions do not have charts. Sky Program, Earth Centred Universe. This program is available as a shareware program and runs under Windows 3.x and Win95. It is available on the AXE network at the path x:\public\apps\ecu\ecu.exe. You can download a shareware version of this program from ftp://hercules.stmarys.ca/ecu/. Several exercises and projects will be done with the program througout the course. If you download the program and use it on your computer, you are encourage to register the program with its author, Dave Lane. 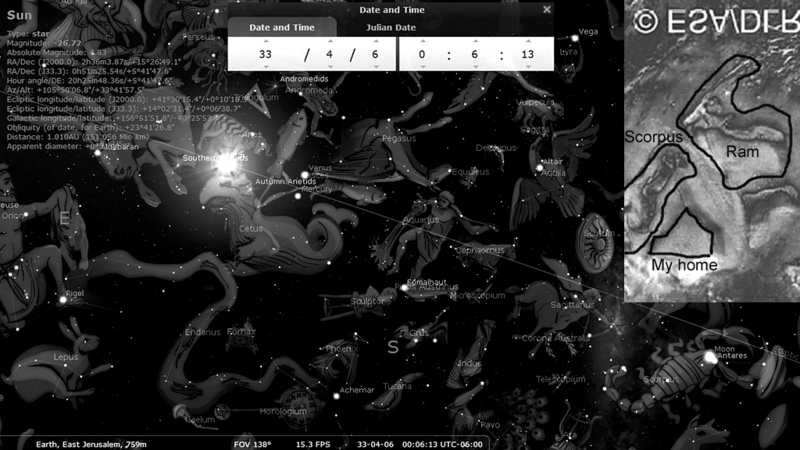 Examine the origin of the celestial coordinate presently in the constellation of Pisces (the fish). Above Pisces is the Great Square of Pegasus. 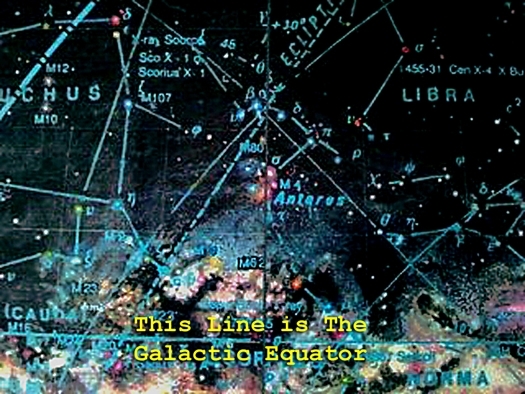 Find the celestial coordinates of the star in the south-east (lower left in the northern hemisphere) corner of the square (gamma in Pegasus). Use the Star Chart at zero of R.A. and declination or the star chart in Chaisson on page S-4. You will have to estimate the values from the given coordinate lines. ..gamma is 15 degrees north of the celestial equator and hence has a declination of +15 degrees or 15 degrees north. ..it is east of the zero of right ascension by 13 minutes of right ascension. Remember 1 degree = 4 min R.A. so this is 2-1/4 degrees east. ..The coordinates of gamma are 13 m R.A. and +15 degrees dec.
Name the Star and Constellation at 16h 30m and -26 degrees 18'. Notice, usually right ascension is given first; hour is abbreviated as h and minutes as m. You will find that the Chaisson chart to use is S-3 and that the on-line atlas is south 45 dec and 16 hours R.A.. ..The star is alpha in Scorpius and has the name Antares. Here's the web site the copy-paste was not that great. Why does Jesus put so much into Mars and Scorpius/Antares . The apostle Paul expounded on the 'UNKNOWN GOD'S" altar to the Athenians on Mars Hill (Acts 17:18-19) Next Paul went on to Corinth where there was an Antares aligned temple (Acts 18). 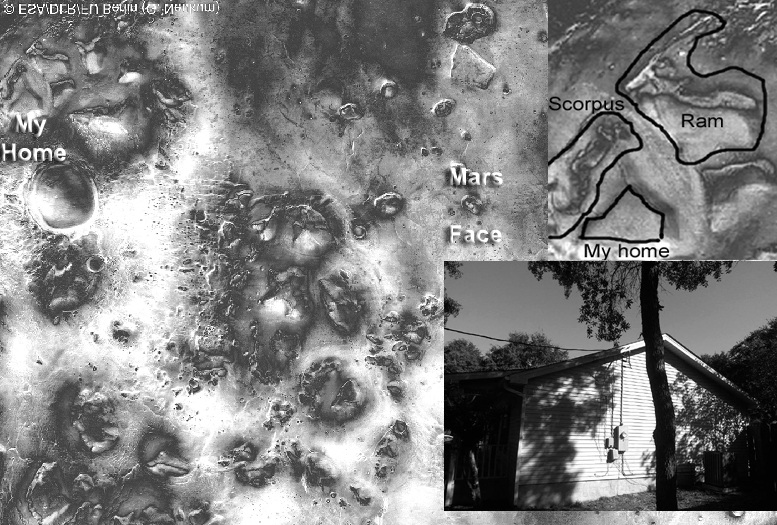 Then He shows me my home which address is 1630 with Scorpius/Antares above my home which lies at RA 1630 on Mars. With the Ram which has the Greek symbol for the Ram in front of my name Buster on the galaxy map I own. [*]Earth rotation from West to East -->Motion of the Celestial Sphere from East to West. This was part i found most interesting. Thanks Done. Right now if you look along the elliptic at dusk South you will see 4 Planets with Antares, and the Moon. Left to right Mars, Saturn, Jupiter, and Venus. Sky with Resurrection Cross on my birth date. "Beware the bearers of FALSE gifts & their BROKEN PROMISES. Numbers scrambled for Antares RA1630 and my home address 1630. 5-5-12-18-9-10-21-5 you can also get 05-21-1958 out of that, my birth date scrambled. 1630xPI=5120.8 So in the glyph is the numbers for my home address and birth date. 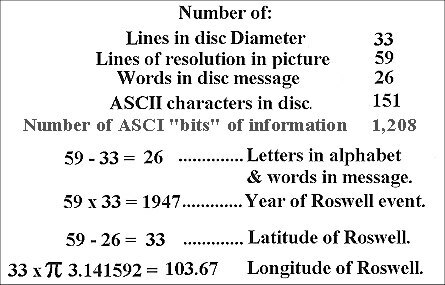 Also 103.6 is the latitude of Roswell NM and is twice the slope angle of the Great Pyramid=51.8x2 my home address and birth date scrambled. 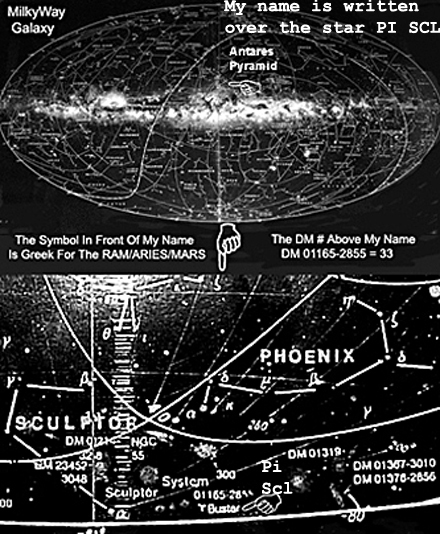 The Eagle is the Antares Pyramid. Thanks again Done for sharing the wealth of knowledge and verses that God gave you. We can't see it until we see it but i'm praying our eyes will be opened. Here's a video/gift for you (all) that may be somewhat related. Cool video, but I'm on a Quest to find out what happen to me back in 2005 when I started looking into all this. 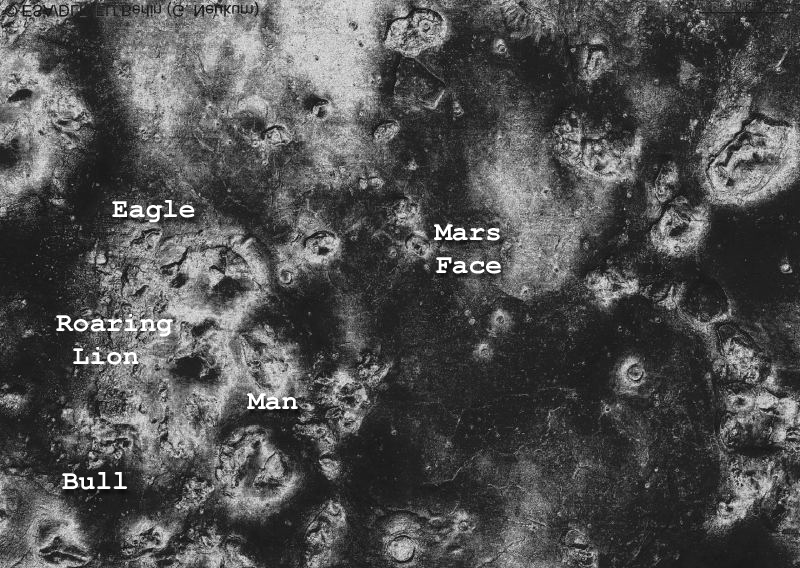 I believe it was God who enter into my mind and told me that there was more to Cydonia Mars then what NASA and ESA was showing and telling us. The last 13 years I've spent has been to prove God is real and he had shown me the four living creatures on Cydonia Mars and God had shown proof it was I to show you all this. That's why you see my home address and birth date. Also the giant Cross on it's side the day of my birth, meaning the Resurrection of Jesus. It was to bring proof and truth to what I was showing you all (didn't get it all right) that I needed saving myself from the path I was on back then. Most here has seen for years my quest to do so. Sharing it all with you all here as I've gone through this personal quest. Love you all here with some very special friends here. Sharing openly what I got right and wrong, without being bashed for it here. Feeling safe to say what's on my mind. Subject: Re: The Crabwood Glyph info: David Flynn missed!! !